If it’s thanksgiving it’s cranberry sauce! American cranberry. We have dried or frozen berries, juice or sauce. 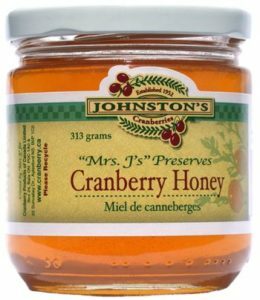 But what is cranberry honey? Distribution: throughout the cooler regions of the Northern Hemisphere, including northern Europe, northern Asia and northern North America. 1. In Britain, central and northern Europe, cranberry may refer to the native species Vaccinium oxycoccos, aka small cranberry, bog cranberry, swamp cranberry, particularly in Britain, just cranberry. 2. In the northern United States, Canada and Chile, cranberry refers to Vaccinium macrocarpon. This makes the fruit of the Thanksgiving Day. 3. Also native to North America from Newfoundland west to British Columbia, south to Washington state and east to northern Virginia, another “cranberry” called Viburnum trilobum, known as cranberrybush viburnum, American cranberrybush, or highbush cranberry is in fact a species of Viburnum very closely related to the European and Asian Viburnum opulus and is often treated as a variety of it, as Viburnum opulus L. var. americanum. Although often called “highbush cranberry”, it is not a cranberry. The name comes from the red fruits which look superficially like cranberries and ripen at the same time of year. The fruits are sour and rich in vitamin C and can be eaten raw or cooked. Vaccinium macrocarpon is a shrub, often ascending (trailing along the surface of the ground for some distance but then curving upwards). It produces white or pink flowers followed by sour-tasting red or pink berries 9–14 mm across. It is also called large cranberry, American cranberry and bearberry and and it is included in the subgenus Oxycoccus, genus Vaccinium. Lots of people believe this shrub grows in water, but this is only a misunderstanding due to its harvesting process. 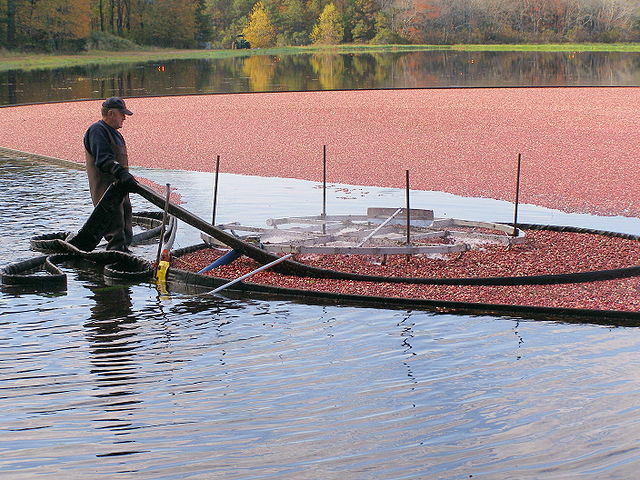 Cranberry berries float on the water, that is why it is much easier to first flood the fields (also called “bogs” or “marshes”) and then mechanically harvest. 5% of all crop is sold fresh while the rest of 95% is found in dried sweetened cranberries, juice and sauce. Wisconsin (with more than 57% total production), Massachusetts (up to 30%), New Jersey Oregon and Washington – are the main states that produce cranberries. Americans consume almost the entire harvest of the year on Thanksgiving day. No table is allowed to exist without cranberry sauce! Considering the importance of this fruit in the American Thanksgiving Day there should be a lot of honey also harvested from the large fields of cranberry. But unfortunately there is not as much as we would like. The study conducted by KE MacKenzie in 1993 and published in apidologie.org determined the behavior of honey bees and bumble bees while foraging on cultivated cranberry in southeastern Massachusetts. The study’s conclusions revealed that bumble bees were much more consistent foragers than honey bees. Whether collecting nectar or pollen, bumble bees almost always approached a flower in a manner that pollen transfer could occur. Honey bees foraged for nectar by probing at the base of the flower. Numerous wild bees have been observed foraging on cranberry, typically 25-30 species in a given area. Large bees are the most effective pollinators. In the study, honey bees rarely foraged pollen on cranberry, a few honey bee foragers collected pollen by drumming the anthers with their forelegs and significantly fewer honey bees foraged legitimately for nectar or collected pollen than did bumble bees. Honey bees were slower foragers on cranberry than were bumble bees leading to the conclusion that bumble bees appear to be better cranberry pollinators than honey bees. Other researchers have noted in time that honey bees forage without touching the stigma and thus do not pollinate the flower (Roberts and Struckmeyer, 1942; Farrar and Bain, 1946; Franklin, 1950). No wonder then that cranberry fields owners do not ask beekeepers for help. two weeks annually. And to make things even worse, other plants, with more abundant nectar, bloom at the same time. Not to mention that cranberry is not a strong producer of either pollen or nectar anyway. That is why, in order to produce honey farmers will often mow the areas around their cranberry bogs to encourage the bees to work only the cranberries. Nevertheless, pollination is important for cranberries. Beekeepers say that without honeybees, cranberry bogs produce approximately 15 berries per square foot. With pollination, they produce up to 150! This makes a huge difference in the price we pay for our cran-fruit drinks and holiday cranberry sauce. Cranberry farmers typically lease 1-2 hives per acre for the increase in fruit production. Taste: while cranberries are known for their tartness, the honey is delightfully sweet and pairs well with apples, pork, poultry and dark chocolate. Some people report a light nutty taste. 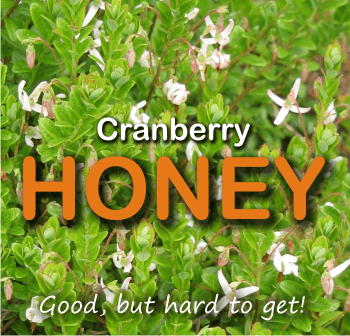 Cranberry honey is a great source of natural antioxidants just like the cranberries themselves! It is recommended for urinary infections, digestive and respiratory conditions. If you have an urinary infection you have definitely heard of the good benefit of cranberry. Almost every treatment scheme includes it. The cranberry has a fructose compound and proanthocyanidins, which prevent the adherence of many bacteria, Escherichia coli included. It is not an antiseptic or antibiotic, but it has high amounts of phenols (antioxidants) and Vitamin C (easy absorbable) and high nutrition levels. This study showed that propolis potentiated the effect of cranberry proanthocyanidins on adhesion, motility, biofilm formation, iron metabolism and stress response of UPEC. Cranberry + propolis treatment could represent an interesting new strategy to prevent recurrent UTI. It is said that American Indians knew about the anti-imflammatory properties of cranberries. They used to spread smashed cranberries on their arrow wounds. It’s hard to find pure raw cranberry honey. On Amazon we can find multifloral honeys which include multifloral honeys which include cranberry nectar and infused honey . You can also find cranberry honey at other online shops such as beefolks.com, zaxbeeswax.com, laneyhoney.com, Wisconsinmade.com or from Canada here: cranberry.ca, honeybeecentre.com. I think getting too much worried or cautions about a few pounds can also lead to stress, anxiety, eating disorder and many other problems. I have been on that road and this Online therapy website has been really helpful to me. You can also check it out and let me know about your experience.